In the 1980s curator Sandra Drew staged a series of ground­breaking exhibitions in locations around Canterbury. 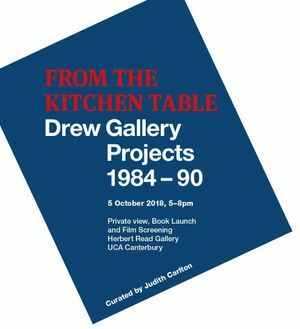 Drew Gallery Projects supported artists in the early stages of their careers, often experimenting with 'new media' which didn't resemble what was broadly accepted as sculpture at the time (video, objects, photography, installation, performance and text.) This exhibition brings together original and related works from these ambitious and impactful shows and the Drew Gallery Projects' archive, telling the story of how these exhibitions came about and why their legacy is enormous. and 'do-ers', for many years to come. During the initial conversations regarding the archive's digitisation it soon became imperative to shine a light on Drew's continuing contemporary relevance within the curatorial and artistic­led activity which in 2018 is taken as given, and yet would not have happened if it weren't for people like Sandra who pushed, and pushed, until it happened. The exhibitions in Canterbury, Folkestone and London during 2018-19 and the accompanying publication celebrates Sandra Drew's visionary legacy to a whole new generation, a career that has remained modestly observed and yet passionately championed by those artists, students and communities who directly benefited from Drew's revolutionary curatorial spirit during the 80s and 90s.